I have always been curious to see more closely how art hedge funds operate and make their money. I've recently completed some research on this topic and the results are below. Interview with fine art hedge fund manager Justin Williams. He is unconventional short-term art trader (maximum holding of three yrs, Avg. holding only three and a half months), and he believes art market has enough depth and liquidity to enable him to use that strategy. For quick sell back, he focuses on living young, upcoming artists’ works. He mentions art market withstood the global credit crisis, but major geo-political risk (which affecting global economy) is biggest threat to the art funds. 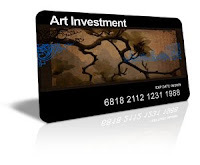 Great resource on the different motivations to invest in art. This article describes who individuals or hedge funds often invest art because of a wide range of reasons which can include diversification, capital appreciation, economic slowdown, speculation, taxation, philanthropy, and social status. View this resource by clicking here. Article explains about how some hedge fund managers are borrowing against their massive art collection as collateral to resolve cash problems. (also, selling their possession) “300 managers with a median net worth of more than $60 million, found the average respondent spent nearly $4 million on fine art in 2005.” So, article questions if art market price will hold up during this time of hedge fund turmoil. Hedge fund managers turn their attention to new asset class- vintage guitars. Informational art fund related website. Brief summary of what art hedge fund is, and how they operate. Also, buyer and seller pays premium around 20% to auction process. Draw backs- low transparency, investing in individual art work reduces diversification; index does not reflect transaction cost or art work fail to auction off. Andy Warhol-based fund says art boom to go on. “A hedge fund that invests in prints by Andy Warhol, the pop artist known for his brightly colored paintings of Campbell soup cans, is betting the boom in the art market will continue because of increasing global wealth” Interviewer here emphasizes the fact art market was unaffected by subprime crisis. Well established artist’s works are more stable even during financial turmoil. Since, are is not reproducible increasing income level will drive demand up and supply staying or declining, thus providing solid long-term performance. Guest post produced by Sean Kim.